Hi Friends! Well, I can’t believe we only have about 10 more sleeps left in this house! Kind of blows my mind when I think about it and in my quest to share with you all of the spaces I haven’t shared before, I’ve got one last space on my agenda (our entry) that I hope you’ll enjoy! I don’t think I’ll get around to my son’s bedroom and bathroom or the playroom (especially since I just sold half the furniture in there at a successful garage sale over the weekend) but, I may share a photo or two at some point…just not enough time in the day to do it all before we are out of here! 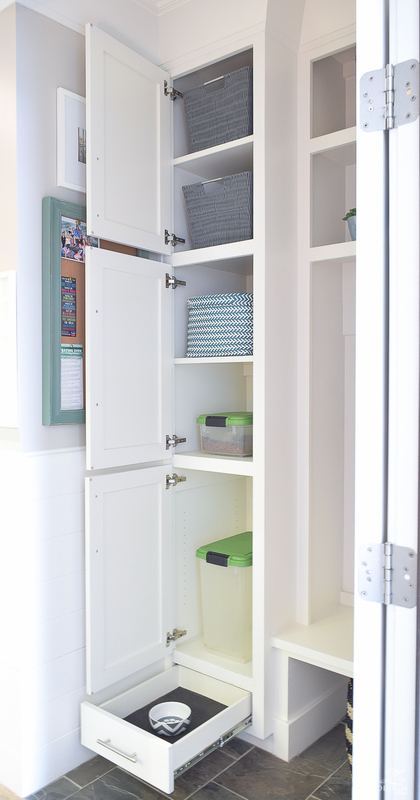 Do you struggle with a small space to organize all the things your family needs at the back door as you enter and exit your home? Well, I always have too and in this home I had an opportunity to design what I call our “back hall, aka central hub” to make it functional and practical, but also beautiful for our family to do real life in. Now, let’s get started! 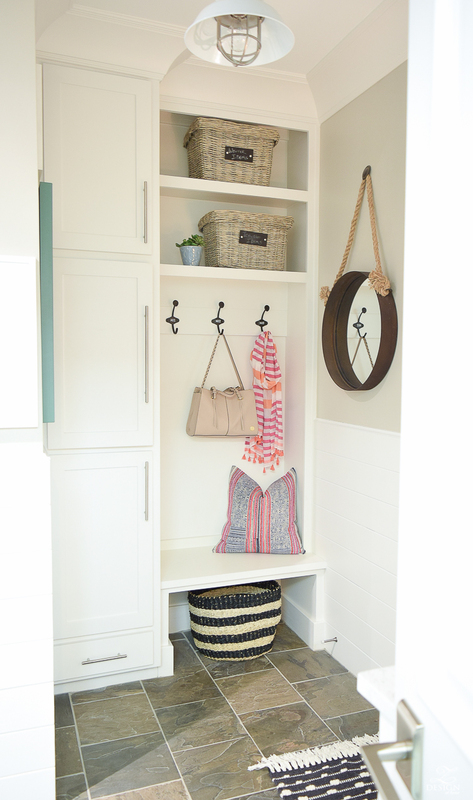 One of the most coveted things most of us want now a days is a mud room to drop back packs, purses, jackets, shoes, and more and sometimes it can be difficult with a small space to have enough room to do all of that. We purchased our home when it was already under construction and the framing stage had just been completed so the very first thing I did was to have our builder rip out the framing for the coat closet as soon as you walk in the back door from the garage. I knew we already had a coat closet by the front door so there was no need for another when what we really needed more (and I think most families do) was a mud room area that included some hooks, a bench, and some cabinetry to hide and store all the things. I made sure there was some space under the bench for a pretty basket to hold shoes, plus I put as many hooks on the wall as I could squeeze into one little space. My school house hooks are no longer available but I’ve sourced some similar ones here and here. And P.S. can we just talk about this bag for a moment…I recently found this one for spring and couldn’t love it more!! It has a ton of pockets and I love the soft blush color. And it’s just the right size…not too big and not too small. It’s also lined with a light fabric that hides dirt so that you can see your things when you look down into it! 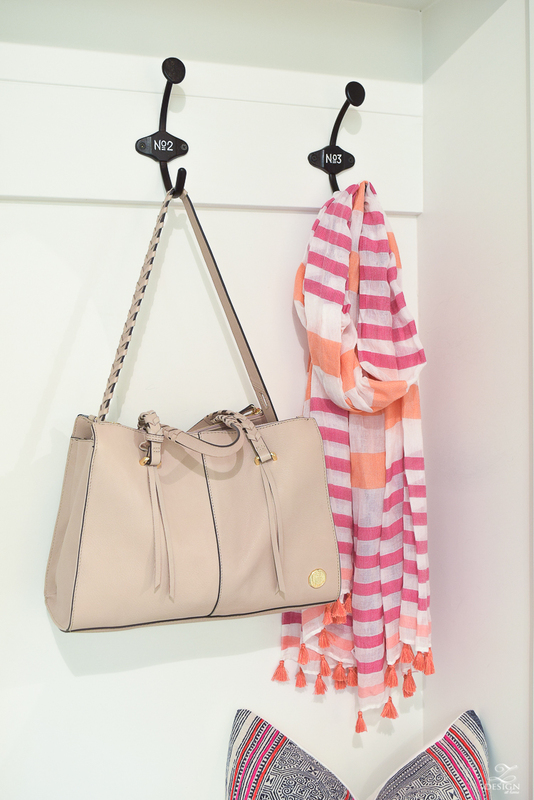 It’s just the prefect bag for spring/summer and you can find it here in a British tan and here on sale right now in the blush! I loved it so much I got the coordinating computer bag here for when I travel with my lap top. Ok, back to the tour…the main key here was to organize the space to make it functional for us but also to make it pretty. The baskets up top were from HomeGoods (4 yrs. ago) but the big deal here was the storage to the left and how I organized the cabinetry with our cabinet maker to create a pet station (more on that in a moment). And of course there had to be a mirror in this area to check yourself on the way out. This mirror actually came as a pack of two (one large and one smaller) and you’ll see the other in a moment as we near the end of this post. When I was designing this space with my cabinet maker I knew I needed lots of space for dog paraphernalia (at the time we had 3 dogs) but of course this space could have been used for any kind of storage needs, and could have even been designed as a coat cabinet since it’s deep enough. To get the height measurement for this drawer I simply picked out bowls that I wanted to use (I used to feed two dogs out of the drawer when we had more pups) and had my cabinet maker to make the drawer deep enough to accommodate the height of the bowls and this set up has worked perfectly!! 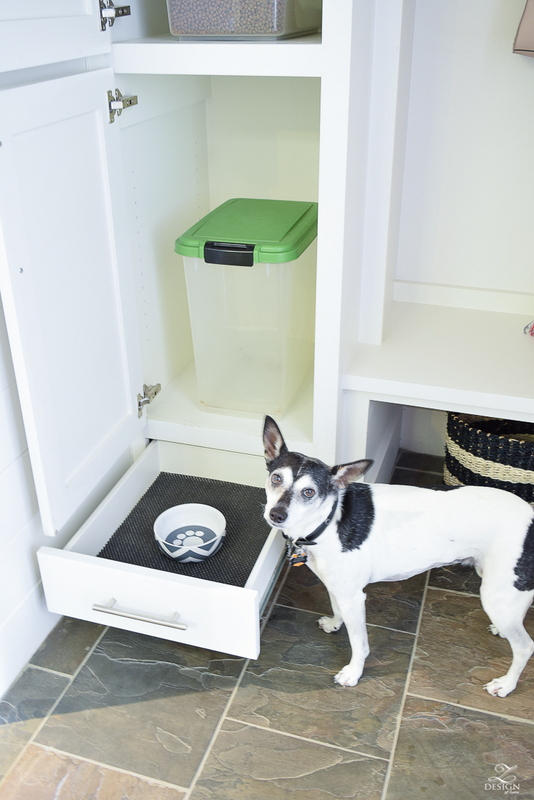 We keep the water bowl in a corner in the laundry room close by but I have better plans next time around to have the water bowl built into the cabinetry as well. 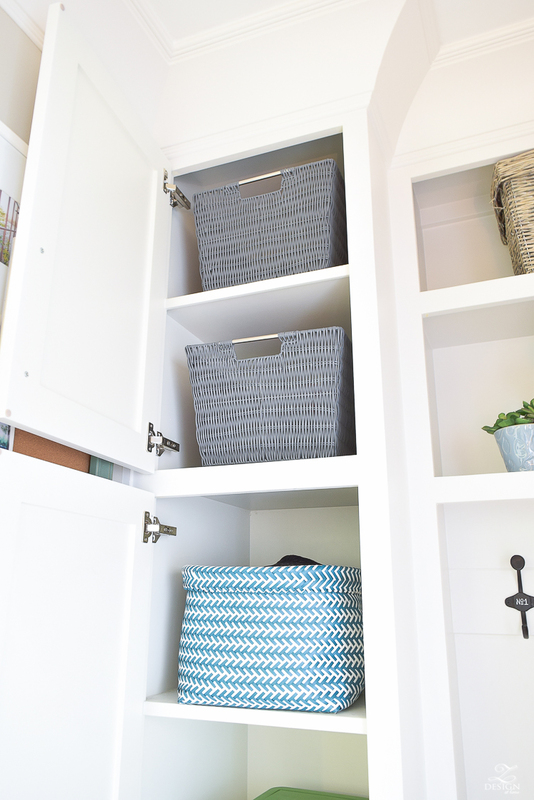 The upper storage in this cabinet is all about pretty, functional baskets that won’t scratch my cabinets. These gray baskets are the absolute best baskets and I originally found a few at HomeGoods when we first moved in but have since loaded up on them from Amazon for my whole home. 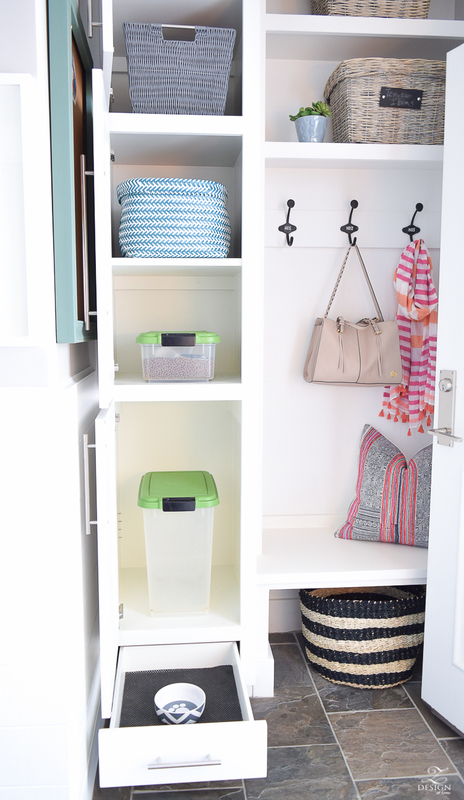 They are made out of a soft plastic so they won’t scratch up the inside of your cabinets or drawers and I am completely obsessed with them for organization all around my home!! The turquoise basket was a fun addition for a pop of color in here (similar baskets here in multiple colors) but these are also a soft, synthetic material that won’t scratch your cabinets either! Two different dog food storage containers were used since we have one small dog and had two larger dogs at the time. Again, I went out and purchased the containers 1st before the cabinet was designed so that everything would fit properly into the space. I also hung a cork board in this area for school papers and for daily activity reminders (sorry, just realized I failed to get a photo of that!). Across from the mud area is what we call the message center that is there immediately when you open the door from the garage. It’s a great place to drop mail and is where I located our wireless printer, under the cabinet. There was no room under or around my desk area for it (coming up soon) so this was the only logical place for it. The tray is also a great place to hold things you know you will need to grab on your way out. A small table lamp was included as well for under cabinet lighting. 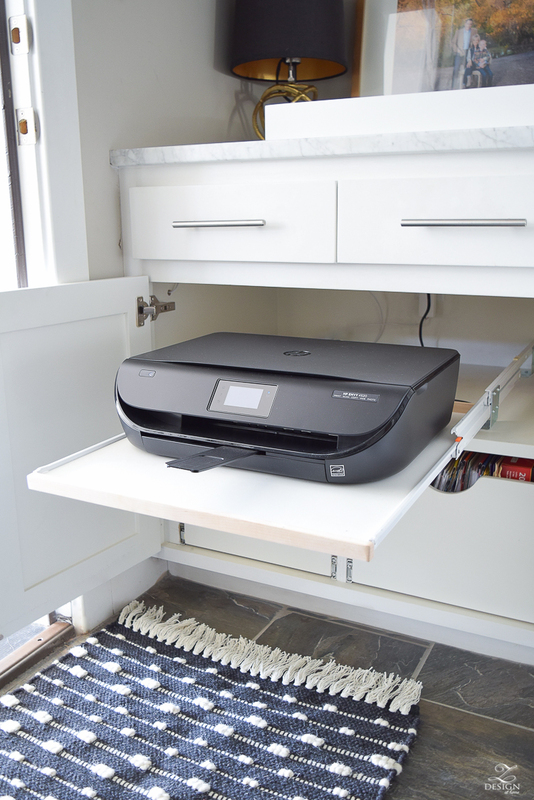 I used this similar shelf so that the shelf can slide in and out of the cabinet to access the printer for changing the ink, etc. I also designed and organized the shelving in here (using this printer) so that everything would fit just right and so that I would still be able to have file space below the printer. It’s a tight fit but everything works perfectly here! 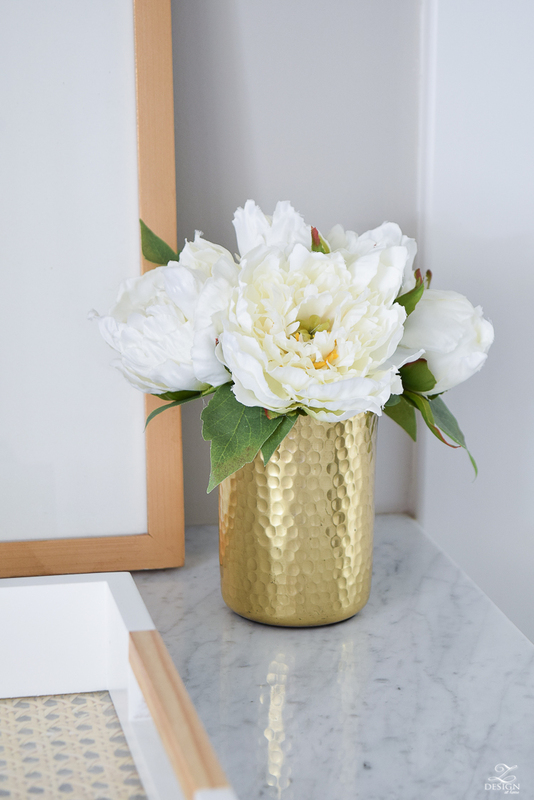 And of course I had to include a faux peony bouquet in this hammered gold pencil cup here to brighten this little spot. Next up is my little work space which is to the right of the message station, on the other side of the laundry room! 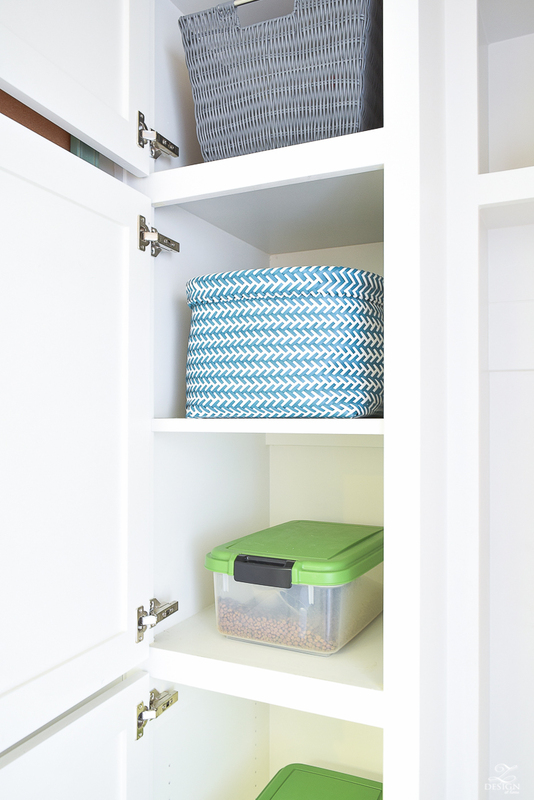 It’s pretty simple really with just one drawer and a cabinet above for binders and boxes that hold necessities. 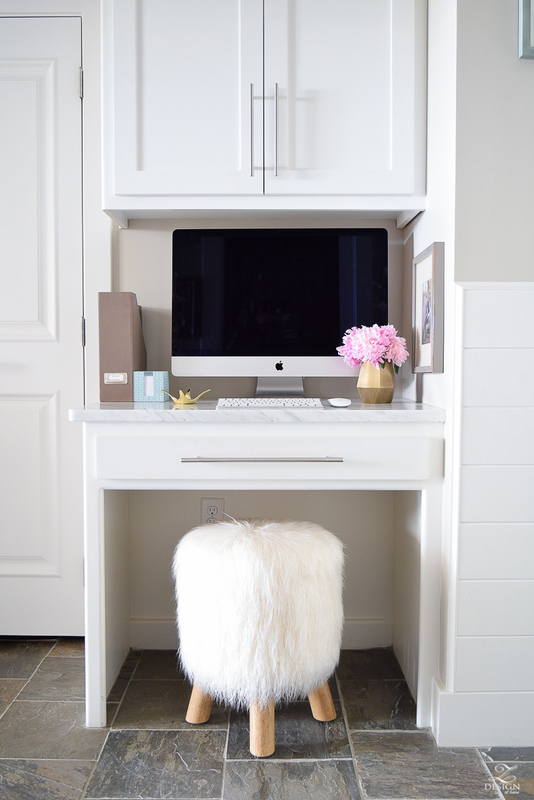 This has been a great little space for while starting my blog and working on client projects and I’ve been thankful to have it but, I can’t wait to share my plans soon for a study in the new house (if you need to get caught up on our #FinallyHomeProject where I recently talked about our impending moving, you can do that HERE). And last but not least is the area where you head back into the rest of the house (to the left is the kitchen…take a kitchen tour HERE). 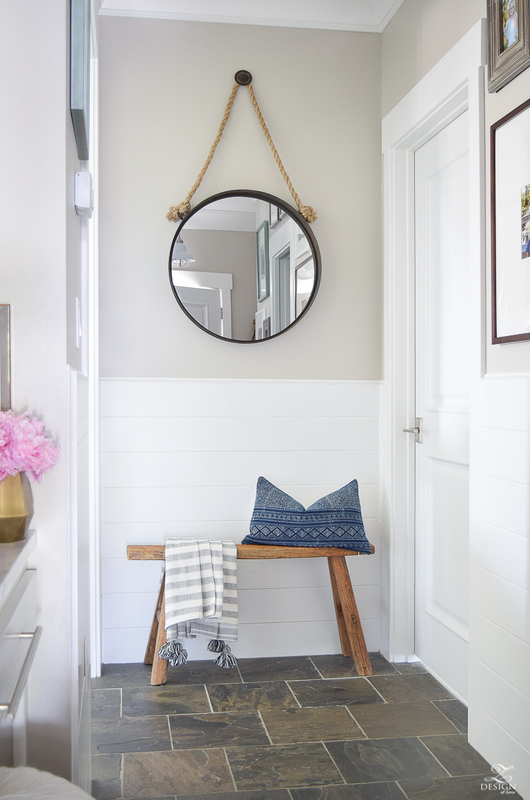 There is no room for a real piece of furniture on this wall so I included a mirror to help make the space feel larger (rather than say a piece of art) and I found this little wooden bench at HomeGoods (similar here & here) and knew it would be perfect here. It serves as a place to sit down and put your shoes on if someone else is taking up the bench in the mud area. Even though it’s simple I really love this little area that is your first view when you walk in the back door from the garage. I usually try to keep a cute pillow and throw here as well to dress things up a bit! Last but not least are my floors back here in case you were curious. They’re slate and at the time these were a budget choice and while I don’t hate them I can’t recommend them. They hide dirt and dog hair beautifully but other than that they aren’t the prettiest to look at. Four years ago I loved them but am ready to move on if you know what I mean. My tile installer called them a toe stumper and I’d have to say he was right, lol! 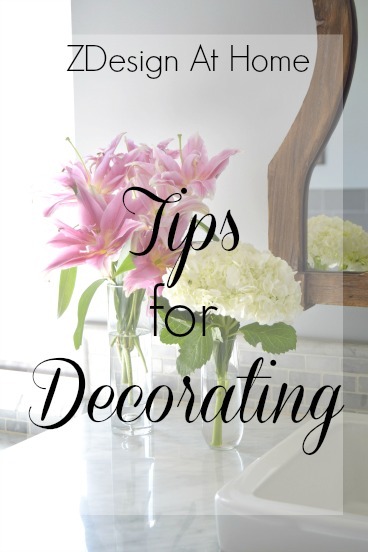 Now to recap my tips for designing your own beautiful and functional entry! 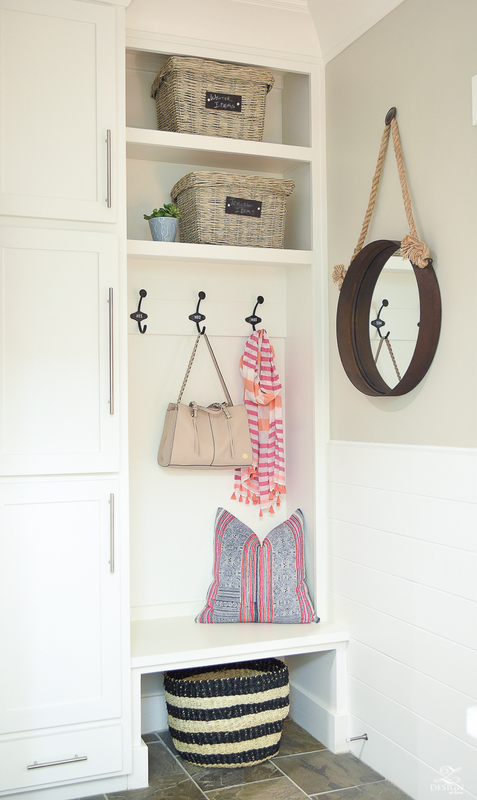 If you have a small space like I do, work with your contractor to create a mud room/area vs. a closed in coat closet that will make the space feel much smaller. 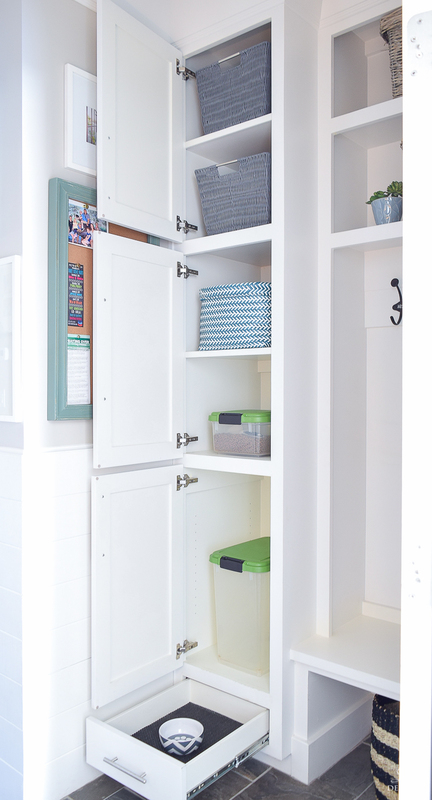 This will also allow you to create shelving and/or cabinets for storage, a place to sit to put shoes on and, a place to hang back packs and outerwear. 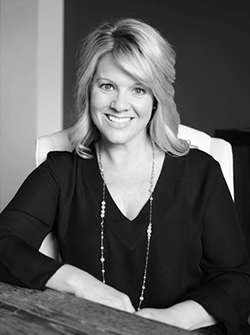 If building or remodeling try to think ahead of all the things you’ll be doing and needing in this space and have your cabinet maker build your cabinetry to fit your needs. 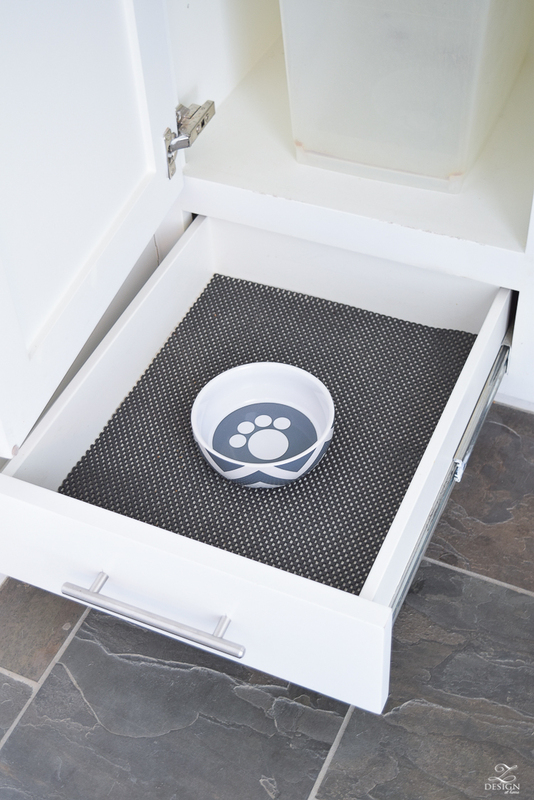 You may have to purchase baskets, bowls, bins and yes, even a printer in advance to get the proper measurements inside your cabinets but at the end of the day it’s so worth the effort! 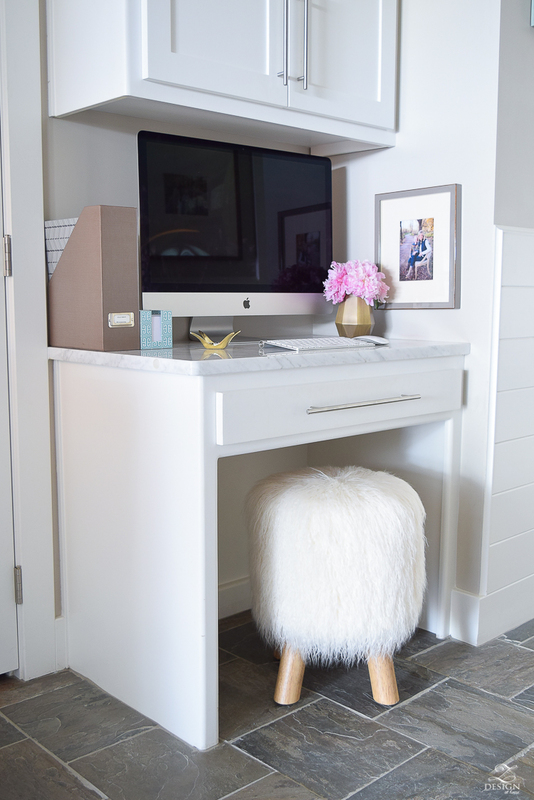 Planning ahead for printers, places to charge iPads and phones, and maybe even a small TV if you are working from a small desk in the space like me can alleviate a lot of stress from cord chaos if you plan ahead for where you will need these things in the space. I didn’t get to do this in this space but having one of these outlets at a charging station for everyone in the family to charge their devices is the best organizational plan for your electronics. I replaced the outlet next to my side of the bed with one of these and it allows me to plug in my phone, iPad and a lamp at the same time over night. It’s a great tool!! By far the best thing we did in our back entry was to add the tongue and groove walls up to chair rail height (we did this before ship lap was cool, lol). 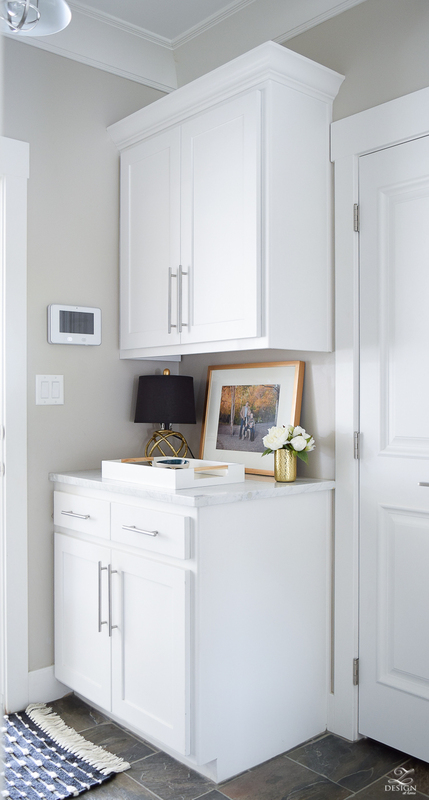 It keeps the walls clean in this busy spot and is something I highly recommend doing if you can fit it into your budget. It also looks great and I never have to worry about constant scuffs on the walls (and paint touch ups)! 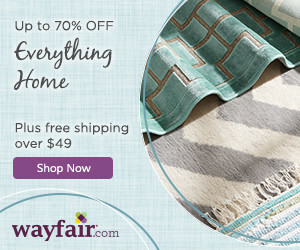 Use pretty baskets, trays, and decor to decorate this space just as you would the rest of the home. I don’t know about you but I spend a literal ton of time in my space and I think I would go crazy if it were just vanilla. 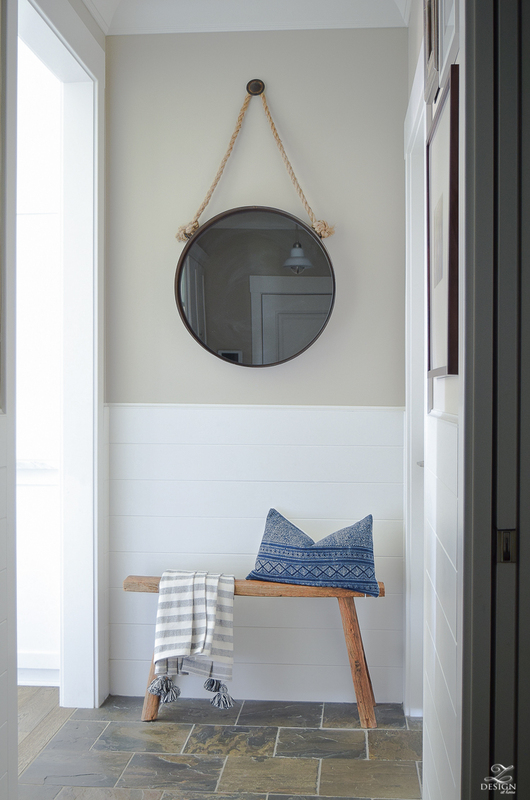 Also be sure to use mirrors wherever you can to help open up the space to make it feel larger. Well folks, that about wraps it up for room reveals in this house! If I have time I’ll try and get my son’s suite photographed and share it soon but for now we are so close to the finish line of moving out that it may not happen before we vacate. Can’t wait to share that journey with you soon so head on over and get caught up on our #FinallyHomeProject if you still need to. You can do that HERE. I’ll be back next week sharing some new pillows that one of my favorite textile places sent me to help welcome our family into our rental while the house is under construction so stay tuned for that and, don’t forget to sign up for my weekly news letter in the comments or at the top of my blog page if you haven’ yet had a chance:)! 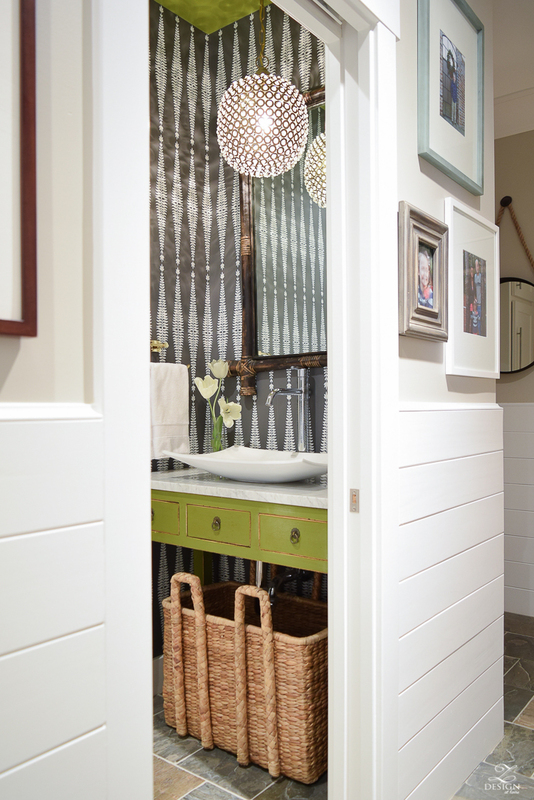 Such great ideas for a mud room. Thanks for sharing ! I’m sure you have posted this before so forgive me if you have. 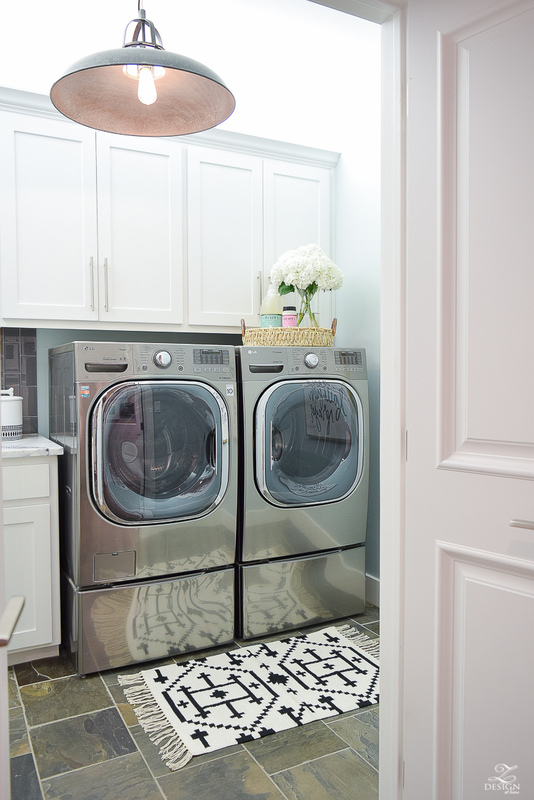 Is the paint in the mud room the same as in the kitchen and living room ? Sherwin Williams On The Rocks ? 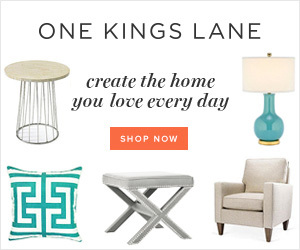 Absolutely love your blog and can’t wait to follow your new build ! 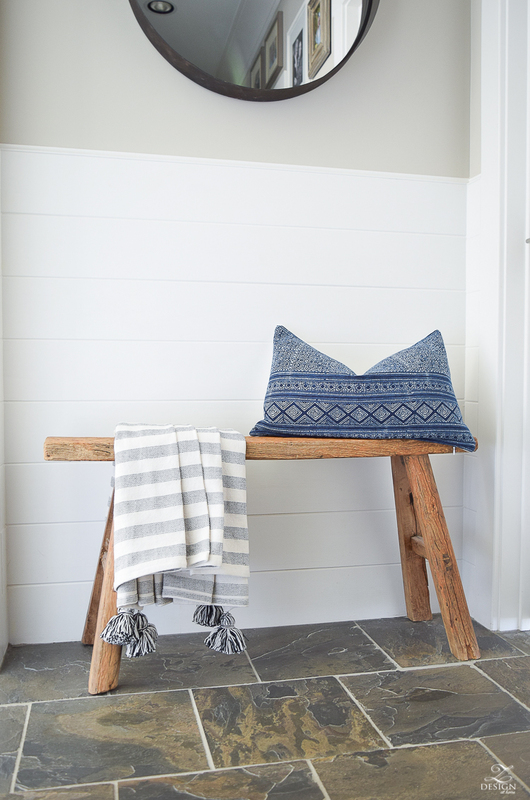 Your mud room looks great, tidy and preppy! Lucky you, I wish I had a mud room, especially such a good looking one. Unfortunately, the only thing we have is a tiny storage room that we converted into a wardrobe for our jackets and were able to place racks to hold our shoes. Best of luck with your upcoming move, can’t wait to hear from you!